Whilst everyone has been finally peeling off their layers of winter clothing. 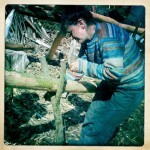 Coppicewood volunteers have been peeling a different sort of layer. 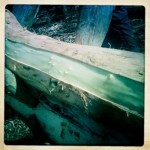 The sap has risen sufficiently for our annual peeling of some willow trunks. Firstly the tough, outer bark is carefully removed using drawer knives and spoke shaves to reveal the material we are looking for, the bast, which is cut in approximately 1 inch wide strips, keeping as much length as possible. It is then coiled up and hung up in the workshop to dry. 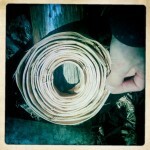 This bast from the willow is a wonderfully flexible and strong material. 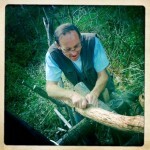 We use it to weave the tops stools and chairs that are made in the woods. It can be used immediately or soaked for a couple of hours in warm water when needed.